I am not feeling the most productive today. I really have tons of stuff I should be doing, like cleaning the bathrooms, ugh. 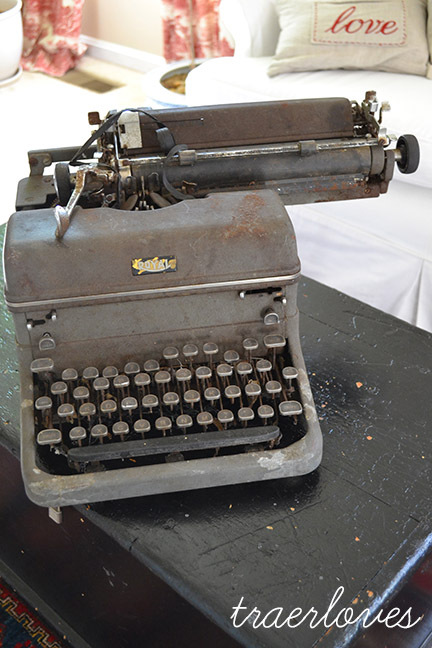 But I decided I was going to clean this typewriter I bought at auction instead. When I bought this typewriter for $1, everyone around me snickered and laughed, and told me “how lucky I was” but I was excited! I know she isn’t much to look at, but I love old typewriters and it reminded me of one I used to play with at my grandmother’s house when I was a kid. It really is a mess though! The last few years of its life have probably been spent in a barn somewhere, but I think it will great cleaned up, and sitting on my desk in my newly refurnished bedroom (which hopefully I will be painting soon!) Anyway, one mans junk is this woman’s treasure! 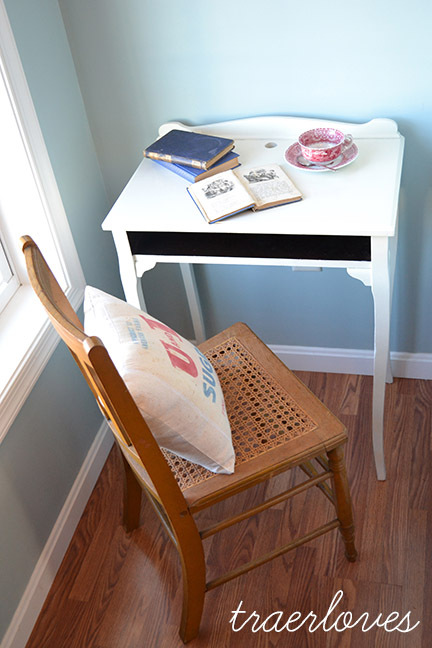 I also just finished painting this little white desk to take down to Maryland tomorrow. It is small and would make a great accent table in a livening room or bedroom. When I bought it, it was painted red on top with a huge fish, and Larry’s bait and tackle shop written on it. Well that had to go. Because the previous owner had used thick red paint I decided to cover it with enamel white. I usually don’t use enamel paint but I had a can of it from the clearance shelf at Sherwin Williams and I thought it would cover the previous paint well. Tomorrow I will be heading down to Maryland to the Stylish Patina Barn sale. If you are local, come down and check it out! Say a prayer that I do well at this one, because I am pretty sure Allen doesn’t like me paying someone to work! Have a wonderful weekend! the desk looks adorable, but i am a huge fan of larry and his bait shop, so sad, too. 😉 totally kidding! Okay, that’s it… I officially need you to teach me to hit those auctions. $1…. you’re kidding! Love that typewriter!